© 2010 by Jessica Ackerman all rights reserved; content may not be copied, rewritten, or republished without authors written permission. The saying goes, "Sugar and spice and everything nice, thats what little girls are made of." 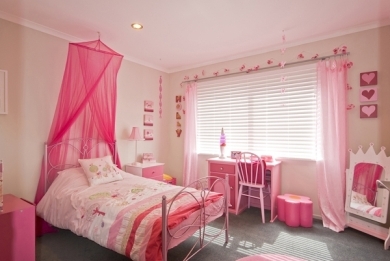 Celebrate the sweetness of a baby girl by decorating her bedroom with a sweet candy theme decor. Bubble gum, gum drops, lollipops and candy bracelets all add personality to a baby girls room. A little imagination and some handcrafted accessories will make this the sweetest nursery in the neighborhood. Nothing says sweetness like the color pink. For the nursery walls, choose a bright, sweet pink that is not too harsh or too purple in tone. Start by painting the walls white. When the paint has dried, use blue painters tape to section off stripes on the walls. Paint wide, alternating, candy pink and white vertical stripes on the wall. White crown molding, baseboards and a white chair rail are all perfect accents to the wall. White bead board is also an option for creating a fun look in a candy theme room. This will make the walls look taller and create a fun, whimsical backdrop for the rest of the rooms decor. Not many curtain manufacturers make candy theme curtains. If finding a fun ready-made candy curtains is next to impossible, try making your own. A trip to the fabric store will probably yield some candy theme fabric that can quickly and easily be transformed into the perfect curtains. If fabric with a candy print is not available, choose a plain fabric and look for candy theme appliques that can be stitched on. Making a curtain from the fabric is then very simple. Once the fabric is cut to the appropriate length, fold the raw edge in and then fold it on top again. Lightly press the folds with a warm iron. Then, using a sewing machine, sew a straight seam around the entire length of the curtain. Fold down the top edge of the fabric approximately five inches. Pin the fabric down and stitch to create an opening for the curtain rod. Accessorizing a candy theme room can be a lot of fun. From wall decor to decorative pillows, the candy theme can transfer easily to all manner of accessories. Some fun ideas include painting wooden letters that make the childs name in a candy theme. Small peppermint swirls, or colorful gumdrops painted on the letters, will carry the theme throughout the room and add a great deal of visual interest. For a bedside lamp, cover the shade with the same candy theme fabric from the curtains. Search online retailers who specialize in fun, whimsical childrens room decor for candy theme throw rugs and other decor. A candy theme is not a typical nursery decor, but it can be one of the most fun to decorate around. The bright colors and inherent sweetness make it a beautiful choice for a baby girls room. Choose bright, cheerful colors and fabrics that are soft and flow with the theme for the best decorating results. Accent the ready made accessories and bedding with handcrafted candy theme sweetness for a truly unique and personalized baby girls nursery. Have you tried any of these techniques yourself? Any fun variations or ideas for some? Please share your ideas in the comment box below! Professional designer Jessica Ackerman, writes for WallDecorandHomeAccents.com, and specializes in decorating with tree wall art and outdoor wall art sculptures. Website © 2010 Kelly Smith all rights reserved; content may not be copied, rewritten, or republished without authors written permission. Article © 2010 Jessica Ackerman All rights reserved.